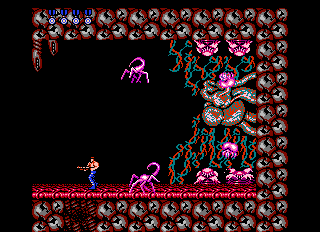 Who can forget the final boss of the original Contra? 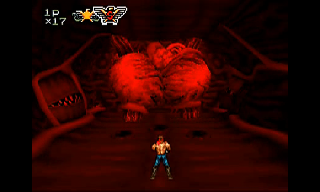 This gigantic heart seems to be the very lifeforce of Red Falcon's biomechanical lair, beating intensely in rhythm with its surroundings. 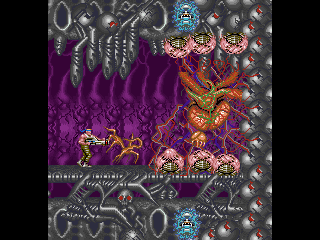 The heart itself has no way of attacking, however, it's protected by four (sometimes more) egg sacks that continuously spawn new facehugger-like creatures that attempt to overwhelm any intruders by their sheer volume. Gomera Mosking makes its first appearance. While the arcade version had 6 eggs, this one only has four. 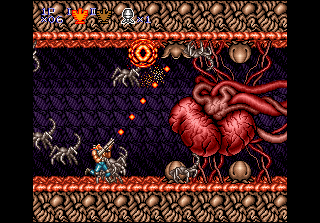 The heart is now merely a mini-boss, but can be just as deadly. This is a pretty interesting design, Gomera comes down from the ceiling and the eggs are attached to the walls, meaning you have enemies coming from both directions. 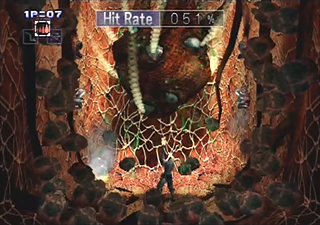 Gomera Mosking appears in a 3D level, but no facehuggers in sight this time. 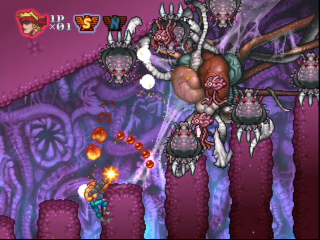 The facehuggers have been replaced with enemies that kinda look like the spaghetti monster(? ).